This device, so far, seems to be the compromise solution I was looking for, to handle the sensor end of things, with more power and less cost than other options I’d looked at, but without the (relatively speaking) overkill (and poor battery life) of a CPU/WiFi SoC. The latter processor is well suited as the aggregation and control node. It’s true the Arduino eco-system contains a huge repository of libraries and projects to jump start many other projects, but the Particle.io eco-system is growing fast. And, thus far I have found the built-in firmware and libraries that are available for the Photon to be well documented and easy to use. It’s a simple thing to use convenient supplied objects for such things as I2C communications, SPI communications, serial communications, WiFi communications, etc. The Photon is a communicator. On Devuan Linux, the Atom Particle environment would not run without the crc32 utility, which does not exists on the system by default. One needs to install libarchive-zip-perl_1.30-7_all.deb to get this utility. Now that IS random, since I’m not really going that route at all. Many Arduino apps are fairly portable to the Photon, but sometimes there’s an issue due to int being 16 bits on the Arduino, and 32 bits on the Photon. In “safe mode” – blinking magenta – the board loads the system firmware and WiFi may work (depending on configuration), but the user program is not executed. If the board is “breathing” white, then the WiFi module has been turned off. Cyan and red, blinking alternatively supposely means bad public keys (cloud related stuff). I have not verified this at all. 3 blinks: could reach internet, but not cloud. 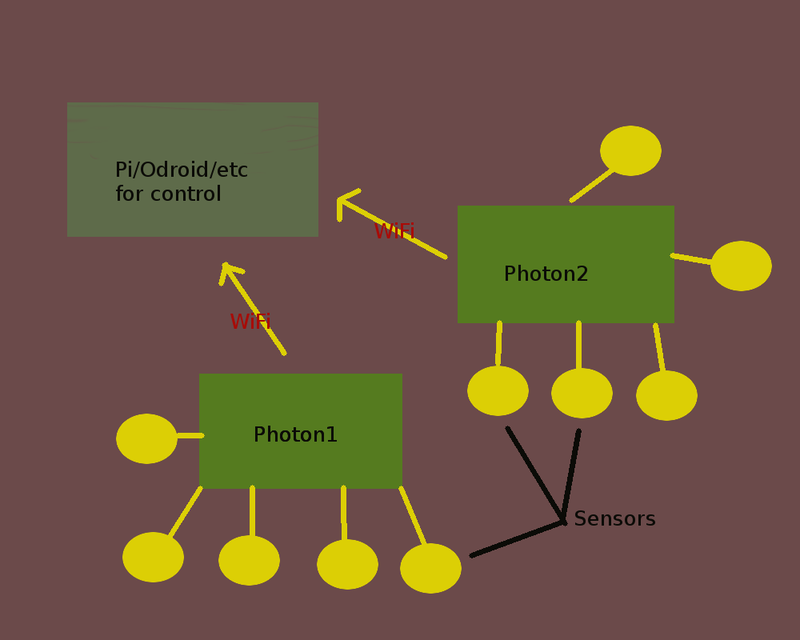 Generally, the Photon should be considered a 3.3 VDC device. So, level shifters should be used when connecting to other systems that do no use 3.3 VDC. The device has some 5 VDC tolerant pins, but the word “some” always bothers me in those situations. 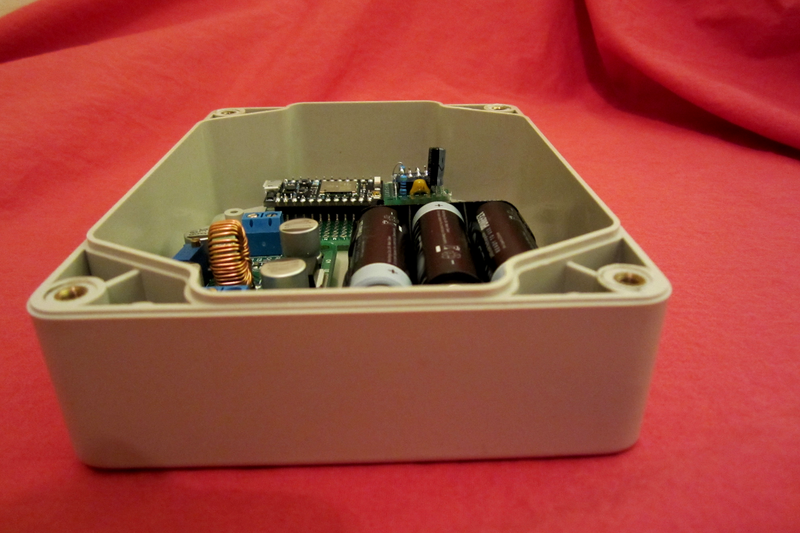 The board has a 3.3 volt regulator, which gets its power from USB or from Vin (5V). This seems to do the trick, and downloads only the user app to the board. I have cycled this procedure a few times, and it seems to do what I’m saying, but I may have more to say about it as time progresses. So, one could just use the dfu-util program, and point it to the proper target directories and board addresses, and “flash” the board manually. In fact, that’s what the build system is doing with the “program-dfu” option. It’s a lot nicer to let the build system flash the board. Threads are usable, but I’ve not seen any mutexes yet. In the meantime, one can use the “critical section” statement to keep threads in order. The tcpserver app I used (after a little modification), was pulled from a contributor snippet on Particle.io. There are lots of little snippets on the site, and in connected githubs. Many are geared to cloud connections, but are usually easy-peasy to port to a local-net-only sort of setup, which I have here. Note: the Photon referenced in this post is manufactured by the folks at particle.io, and this site and author are not related to them in any way. PHOTON is a trademark of Particle Industries, Inc. The Arduino is manufactured by the people at Arduino.org, and they are not affiliated with this site or author in any way.